Sectarianism is singled out in Scotland as an example of a particularly bad inherent problem. No one is prepared to give compelling facts and figures on the matter, but rather to speculate on the extent of the problem we have. I’m willing to suggest it is miniscule in proportion. 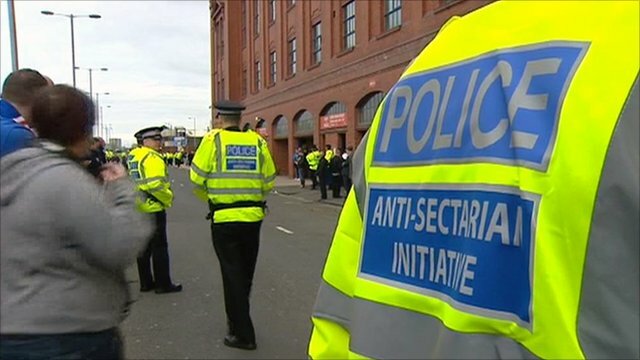 The Dictionary definition of Sectarianism is a blurred mix of exactitude, in fact, it shows a considerable similarity to the new sectarian focused legislation being beaten around Holyrood: The Offensive Behaviour at Football and Threatening Communications Bill. It would be pointless to suggest that the Sectarianism presumed in Scotland is based on anything more than a Catholic and Protestant divide, particularly focused around the West Coast of Scotland, though not exclusively. This is not a new phenomena, it a problem that can be traced back for generations. There is certainly no coincidence that this is the area of land that falls closest to its neighbours in Northern Ireland – and area of intense political faction and previous Civil War on the very subject.Not to mention the closest landing point for any fleeing Irish. The history of such is irrelevant for the purpose of this discussion. The problem is apparent in its existence; but in what format. Do Catholics or Protestants struggle to obtain positions of employment in any particular field based on Religion? Not in the experience of many. It would perhaps be nieve to suggest that the case does not arise, it is impossible to police, however on a national balance it would be safe to suggest ability has a far greater bearing on employment stats. So where is this problem evident in Society? I live in the West of Scotland, i spend the vast majority of my time within the different areas of the West of Scotland and, call me lucky, but i struggle to recall a regular day-to-day example where my religion has ever been brought up nevermind used as a means of prejudice. I asked 20 people at random if they could recall such an event – but none could. So where does the problem lie; and does it really exist? The answer is painted in a mural of football. Rangers and Celtic to be precise. The two biggest sporting institutions in the country. It would not be difficult to argue that the vast majority of those following Glasgow Celtic are of Catholic decent; if not in turn, practicing themselves. It would also be fair to presume that the majority of Glasgow Rangers supporters are of the ‘opposite’ Protestant faith, or at least sympathisers of such. In itself this relative fact is no problem. The problem is now untangling the wire of natural dislike between the parties based on footballing rivalry and its actual relevance to religion. It is our fascination of offending or being offended that appears to drive this dislike to a level of ‘Sectarianism’. Do fans of the opposing side really dislike each other because of their religion, or do they perhaps use religion to rile the opposition because of a dislike through the natural rivalry between the teams? Is religion a reason, or an excuse? A way to ‘up the ante’ in a nation where confrontation is neither new nor uncommon. That, is a question for the people to decide subjectively. Everyone has their own personal experiences and each their own opinion both of the problem itself and any possible solution. Much is made of segregation in schools for example, can we really separate children as young as 5 from their friends only to teach them that there is no differences. No divide? Another subject for another day perhaps. Since Devolution in Scotland under the Scotland Act of 1998 the problem of sectarianism has been high on the agenda of every ruling party. Stamp out sectarianism for a better Scotland. The latest attempt at such legislation is The Offensive Behaviour at Football and Threatening Communications (Scotland) Bill that will criminalise behaviour which is threatening, hateful or otherwise offensive at a regulated football match including offensive singing or chanting. It will also criminalise the communication of threats of serious violence and threats intended to incite religious hatred, whether sent through the post or posted on the internet. There is no doubt that the presumption of Sectarianism in Scotland is based primarily on the singing of football fans. Songs of political heritage that have absolutely no relevance in any manner at a sporting event, if at all. The new legislation suggested is deemed to outlaw the singing or chanting of certain songs or terms. Setting a standard of what cannot be said. However, chants that fall short of this standard will not breach the law. It will be up to individual police officers to decide whether the songs are vitriolic or offensive enough to incite wider disorder. The First Minister,Alex Salmond was forced to delay the introduction of the legislation after Rosanna Cunningham, an arch republican, suggested in June this year that singing God Save the Queen, the national anthem, could become a criminal offence. Her attempts to clarify its scope came after Professor Tom Devine, one of Scotland’s most eminent historians, said last week it risked bringing Scottish law into “disrepute” and is a “disaster” in its current form. There are also disputes about it’s incorporation and alignment with European Law. Scot’s Law has forever been historically associated with an objective viewpoint: that of a reasonable person. This principle has been hailed as it has been slammed, allowing much scope for interpretation. This scope is the exact problem with the new proposed bill. No one really knows what it means. A song that i may find offensive could differ greatly from that of my neighbour. Surely for this new bill to be a success or for it to at least achieve a sense of acceptance and credibility it should be far more codified in its nature. Without stereotyping football fans, i am one myself – it is entirely unreasonable to expect a regular football fan to think entirely for themselves for a 90 minute period. The crowd is tribal in nature, it evolves from the first kick of the ball to the last. The mood changes. A football crowd is like an ever evolving race for that 90 minutes period -based entirely on what is happening within the stadia they are situated. Build it and they will come. Make clear rules and they will follow. We build seats – you will sit. This is a clear rule,and one that is generally followed. Do not Smoke – Again, a clear rule, and one that – although not completely eradicated has reduced to a minor issue among a crowd of 50/60000 people. Do not drink alcohol in the ground – Again, a clear rule and one that is generally followed. There are more, but i highlight these as they are rules that 25 years ago (less in most cases) were a generally accepted thing to do. A clear rule was brought in, some grumbling ensued and eventually it was accepted. So what is the difference with this new rule? Simple. We are asking football fans to basically shoot in the dark and find the rules out as they go along. Perfectly..unacceptable. If the SNP Government, the Scottish Parliament or any other source wish to regulate what song or chants occur within a football ground then list the songs or chants that they wish to outlaw. Give a clear guideline, build it – and they will, for the most part, obey. Thought alone in Scotland cannot be criminalised. To remove sectarian thoughts from someones mind is a society problem and one that cannot be policed. To remove it’s abdication through voice, to strangle its advertisement is fair enough, but at least draw up a detailed list of what is acceptable or not. Do not criminalise football fans for having the audacity of ignorance. The Bill of course has come under even more scrutiny yesterday, a scrutiny that undermines the doubtless good intention of the Act and from a source that should at times learn to strangle its own regularly vocal chords. The Catholic Church has expressed its own concern around the proposed legislation. As an institution of faith, subscribed to by 50% of the offending parties in this suggested sectarian problem it should really have kept its opinion out. If indeed there is a prejudice or separation between Catholics and Protestants then interference from one of the Religious groups will cause nothing but further divide. If you wish to bring down a wall, or a barrier, do not attempt to scaffold the structure. Fans of both Rangers and Celtic will argue over the colour of Shite to coin a famous Glaswgian phrase. They do not require much encouragement. This in itself is not sectarian, it’s football rivalry. Like Chelsea Millwar, River plate and Boca juniors and Auckinleck vrs Cummnock – rivals will disagree on anything. Raising a profile such as that of the Catholic church purposes yet a further reason for both sides to collide. If one side backs their stance, the other will follow. What was required was independence interference, not party politics. It is the particular fact that the Catholic Church continuously exert their powers that is a continuous frustration. The Bishop of Paisley raised some very valid points. Points that the majority agree with. He called the proposed Bill, ‘Hasty’ and potentially ‘problematic’. His credibility was quickly lost when he further stated,”Official figures made available some years ago show conclusively that sectarian criminality is made up predominantly of acts of intolerance and hostility towards Catholics”. There is little argument to the contrary. The relevance of such a statement is what breeds concern. The official figures that he refers to relate to a past tense in Scotland – a country that has naturally come on leaps and bounds in its religious and racist prejudices as it evolves as a modern cosmopolitan nation. It does not require vastly outdated figures launched into its current cauldron to further insight the flames. “We know that several years’ worth of subsequent data on sectarian offences against Catholics remains locked in the vaults of the Crown Office. A highly hypocritical statement from a man who represents a religion enshrined in its own failure to release data on its own internal problems relating to years of proven child abuse and other illegal scandal. Certainly not the sort of question required at a time of attempting to solve a problem in a city and a country where ” i was right you were wrong” and “my dads bigger than your dad” and “you hit me first” are popular snags in the resolution of the potential dispute. It is point scoring at it’s worse. Proved when the Bishop concluded: “I would be very sorry if you began to lose the confidence of the Catholic community. A threat, and another prime example of why religion and politics should never mix. The new legislation is well intended, but badly advised. Surely the legally able (Sic) Frank Mullholland should advise with care in future, or at least find a realistic solution rather legislation for legislations sakes. Further muddying the waters or societies cesspool. This entry was posted on October 7, 2011 at 10:25 and is filed under Current Issues, Glasgow Rangers, Politics. You can subscribe via RSS 2.0 feed to this post's comments. A well balanced and fair article, the author seems to be aware of the inherent desire for disagreement between both sides. On a wee side note, My grand-daughter who was educated in a faith school came to our during a school time in tears as her teacher told her all Protestants are bad. She at the age of ten stood up to her teacher and argued that her gran was a Protestant and was a good person.